60% Rayon 40% Silk. Made in Japan. Vtg Red Silky Embroidered Floral Retro Triangle Piano Stole Scarf Wrap Large 66"
Floral Triangle Piano Scarf. About 66" Long. Vintage Erte Unisex Scarf ART DECO 100% Silk RARE letter "M" Circa 1976 Beautifully designed Art DECO style 100% silk unisex scarf. Black with vivid orange and golds. Elegant fringe on short ends with a gold border all around. Hand rolled edges. Made in Italy. 11.25" x 51" CONDITION: Very good. Appears to have been rarely, if ever, worn. Gorgeous either worn or would look nice framed as a piece of art. The repeated pattern is reminiscent of an art deco design. The scarf is in very good condition with no obvious issues noted. Designed by Sally Gee. Lightweight and multi purposed! Can be worn as a neck scarf, head scarf, wrap or sash. Made in Japan WPL 11403. Pam and Don. Vera Neumann Scarf 1970's Blue Stain Glass Rolled Edges 25" X 25"
Vera Neumann Scarf with Rolled Edges. From signature it looks like it was made in the 70's. But as can be seen on this scarf it is one of the rarer multi color, scarfs whose colors are truly stunning. ULTRA RARE RHYTONS SCARF. Year of production: 1973. Art Deco design in Burgundy, Yellow ,Gray,Brown and White colors. Made in Japan. 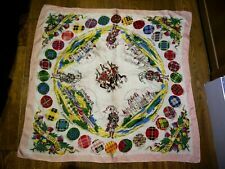 Italian 27" Square Scarf. Size - 27" square. 100% silk. Has Anne Klein lion logo. Green and tan with a little purple tone. Mostly a check pattern with a nice border. Very clean. No spots, stains or snags. 1970s Chiffon and Beaded Boho Hippie Shawl. Pink, yellow & green floral prints on a black back ground ~ Oblong scarf shape. 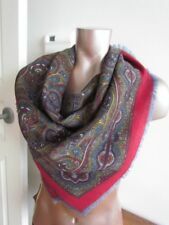 A super scarf, pure wool backed and a fine faux silk paisley side. in a black colorway, with brown paisley colors, it is as new. vintage ladies headscarf scarf wrap delicate lime light green floral 16" x 58"
Rolled edges. Size : approx: 26" Square. Size : approx: 28" Square. Fabric : Polyester. 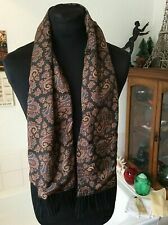 FIORINI VINTAGE SCARF, ART DECO McINTOSH DESIGN, BROWN ORANGE WHITE, LONG. RT DECO McINTOSH DESIGN BROWN ORANGE LONG. Condition is Used but very good. Machine turned edges. Size : approx: 26" Square. Weight Abstract Motif Square Scarf. Beautiful Abstract Motif. VTG 70 s J. Great combination of colors, interesting abstract design which allows you to match the scarf with different color outfits (like 4 scarves in one).